Cory: Well this is quite the transition. We’ve ditched the sunshine of Hawaii for…the sunshine of San Diego. Gone is Magnum’s rugged charm, replaced with two brothers are, if one wearing a cowboy hat and the other wearing a suit didn’t give it away, polar opposites. I am, of course, talking about Simon & Simon, our next stop along the road of 1980s testosterone and wisecracks. We begin, as we always do, with the pilot. But unlike Magnum, P.I.‘s beginning moments with the lead character’s nicely-chiseled body on display, this one begins with a nice lady bringing men food. You know, as they should. I’d like to say it gets better from than there, but I’m not sure if that’s the case. What did you think of the pilot episode, Myc? Myc: I don’t know how someone can make team detective work spanning two sun drenched paradises (San Diego and Mexico) with mobsters, and hit men, and political corruption boring, but Simon & Simon managed to do exactly that. Not to be overly critical, but this pilot was an absolute disaster, and I have no idea how it got picked up let alone drew an audience. Before we get into the details of what exactly went wrong—because clearly There Were Mistakes Made—I just wanted to get your thoughts on the entertainment value (or lack thereof) of this episode. It was so very bland. Or insipid. Dull. Uninteresting. Banal. 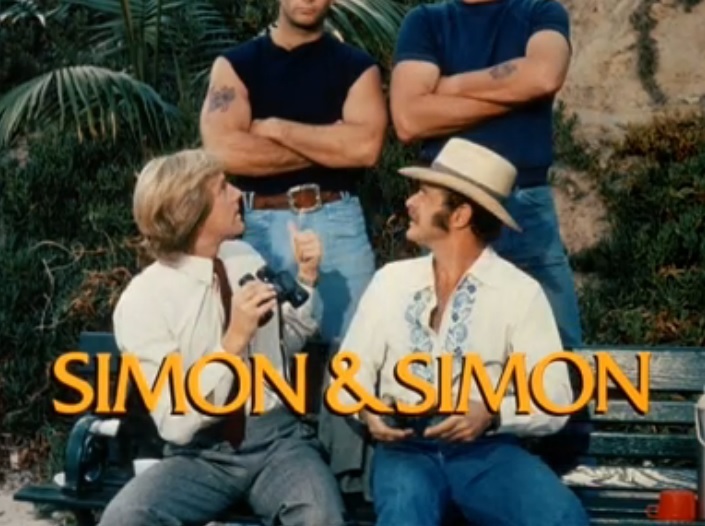 I’m actually considering using Simon & Simon as an adjective to start describing boring, watered down, vanilla programs. Cory: The whole concept isn’t particularly engaging. Two brothers who are detectives and…go. While simplicity has its place and its value, Simon & Simon isn’t interested in making much of an effort. I really wanted this to be legitimately bad so I could enjoy it for that reason, but it never got off the ground in any fashion, good or bad. There’s an underlying assumption that most dramatic television on the broadcast networks in the mid-1980s was dull and uninspired and while I don’t think that is actually true, this show is an example that plays into those assumptions. Despite the presentation of danger, there are no stakes here. The characters get arrested, but are out on bail in next to no time. The case itself is forgettable (literally, I’m forgetting it by the minute). I would say that the best thing the show does have going for it is the larger familial relationships going on. Yes, the show unfortunately goes out of its way to remind us of how different Rick and A.J. are—one’s smart! the other punches people!—but I did appreciate how both of their demeanor changed when they stopped by their mother’s house. She emasculated both of them, though in slightly different, but similarly amusing ways. That sequence gives the pilot its one moment of energy and life. The rest? The definition of generic. Myc: Before we break down the characters and relationships, I want to touch on the direction and cinematography really quickly. When we talked about Magnum over the past few weeks you noted that it was impressively shot. It was well-staged and took advantage of the natural beauty of Hawaii. For Simon & Simon I found the exact opposite to be true. There was some weird handy-cam action that led to some nauseating shakiness. The hard cuts were pretty jarring. And there was one scene (about 35 minutes in) where AJ, Rick, and Carolyn were driving and the angle of the shot literally changed every few seconds. It’s like even the director and the editor were bored and they just kept mixing it up in hopes that it would engage the audience. It made for an ugly episode of television to watch. Cory: This pilot certainly didn’t make the same great use out of San Diego (if they actually shot there) that Magnum made out of Hawaii. It looks and feels cheaper, but I’m not surprised. But the characters! I’m trying to praise the show just a little bit here and you keep avoiding it; I’m guessing that’s telling for how you feel about Simon & Simon as a whole. Myc: Fine. I give in. We can talk character. I’m with you that the characters, particularly the familial relationships, are the strength of the show. But it’s like a cigarette in the night—it only stands out because everything else is so dark, not necessarily because it is so bright. The best part of the pilot was the mother. She takes these Men (80s Men! Real Men!) and turns them into little boys. AJ is the more sophisticated Man-About-Town type. The suave ladies’ man who dresses in expensive clothes and drives fancy cars and uses his mind. 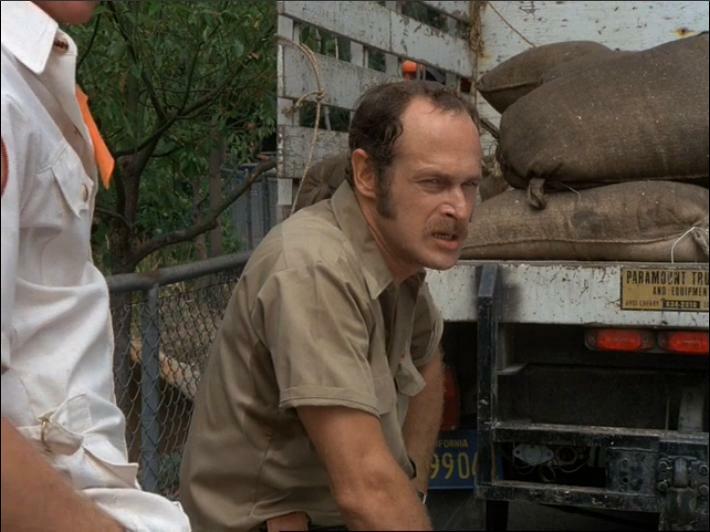 Rick is the more labor-intensive form of man (I mean he is Gerald McRaney after all). He has commons sense, street smarts, and the physical tools to, well, punch people. And just in case we weren’t aware: cowboy hat! But all of that gets tossed out the window when they have to call in their mother for help. Men become boys, and it’s probably the strongest moment of the entire pilot. Outside of the boys and their mother, I am weirded out by the relationship between Janet Fowler (Jeannie Wilson) and the Simons. She’s like their secretary/law student/go-fer/weird sexual consort? But she’s not really any of these things except a law student? There’s some strange sexual tension between her and the heroes that seems very awkward and strange and gives the men a weird amount of control over her body. I’m not sure how to feel about it, because I really like her and I want to read her as a strong independent woman who does whatever she wants, but I just can’t. Then there’s her father, Myron (Eddie Barth), who apparently owns San Diego’s largest detective agency that just so happens to be across the street from the Simon & Simon offices. I get that he’s supposed to serve as a funny, recurring, somewhat likable villain type character, but I’m not so sure it works. Cory: Janet is certainly a weird character. When she comes to get the Simon brothers out of jail, Rick kisses her–which I guess is supposed to be a bit of a surprise since he’s the “older,” “gruffer” one–and her father expresses concern about her hanging out with them. But I didn’t get the impression that she was in a totally steady thing with Rick, which is interesting, or more likely, problematic. And hey, she’s going to law school! She’s totally independent. Except for the part where she brings them food when they want it, or generally waits on them hand and foot. She and the brothers make quite a weird trio, that’s for sure. But let’s move to the second episode we watched, “The Least Dangerous Game.” I’d argue that this one is substantially better than the pilot. A little further into the season, it feels like the writers and the actors have a better grasp on the show’s tone. Whereas the pilot made some attempts at comedy, this one features a particularly dumb conceit that requires the brothers to go undercover at the zoo, resulting in a few silly gags involving Rick being miserable and/or being terrified of animals. I wouldn’t go as far to say that this episode is good, but I think the sillier the show gets, the better off it is. The pilot is just dull and bland; goofy is slightly better. Right? Myc: Goofy is an improvement. This episode shifts things around from what we saw in the pilot (the Simons have a new office look, Janet works for her father, and so on) but the premise remains the same. The silliness of this episode works in its favor, and even manages to poke fun at the idea the show is founded on. The show tells us that the Simons only get this job because they’re cheap and probably not very good at their jobs. Like you mentioned it builds comedy out of putting Rick in amusing situations (being chased up a tree by a bear for instance) while contrasting that against AJ’s relatively easy time undercover where his biggest concern is teenaged girls falling in love with him. That is, until he gets shot with animal tranquilizer. It really does feel like the writers and actors better understand what the show is all about. Yet, the cinematography is still a nightmare. Not to derail, but there is a scene where Rick steals a zoo tour bus and is being chased by a man in a jeep and in one of the shots the bus DISAPPEARS because it was poorly shot/edited (at about 35:43 if anyone is interested). I nearly lost it laughing. Moving on from magically disappearing buses, we get more good familial stuff in this episode. The mother, and her relationship with the boys is clearly the diamond in this show’s rough. The scene where the Simons are having dinner with their mother and her beau, while missing the mark comedically, does serve to build their relationship. I have to say, the “mystery” that our titular detectives have to solve this episode is stretched thin. I mean if there is a guy who donates a million dollars a year to a zoo just so he can exploit it and illegally kidnap and hunt the zoo animals one by one, wouldn’t it be cheaper, easier, and arguably more fun to just, you know, go on a safari? Cory: I was going to comment that the cases feel so tacked-on and secondary, but then I realized that there isn’t really anything in their place. Despite the improved tone and another solid scene with their mother, this episode still has very little to offer. Both of these hours seem plot-thin but seemingly rush to the end of the episode in an instant. Of all shows that I have watched in my life, this one is perfect for watching while doing something else (or 10 other things). There aren’t details worth paying attention to, nor are there especially memorable characters. Do you feel like this second episode had anything interesting to offer masculinity-wise? It seems like the show is more interested in playing the brothers’ types for laughs in this one; Rick gets the tough-man job, but he can’t really handle it, while AJ gets to be effortlessly cool. If I thought there was real effort being made here, I might consider that the show is in on the joke, but I don’t actually think it is. Myc: Masculinity-wise I felt like both hours were doing sort of the same thing: presenting two models of traditional masculinity and poking fun at them. Or at least I hope the show is actively poking fun at them. AJ, as I mentioned before, is the super suave self-controlled masculinity. He’s the handsome, successful, mind focused type of man. Not unlike Rick from Magnum and Face from A-Team. Rick Simon, however, is more the macho-tough guy type. He plays into the sort of physical bodily style of masculinity in the same way that we talked about Magnum last week. He is a man of action. This really ties into some of the other shows we’ve talked about, because he feels very familiar. I wasn’t at all surprised to learn that Rick was a Vietnam veteran when I did a little bit of research, but AJ went to college instead. It makes sense for the way we’ve been talking about early-1980s television masculinity over the last few weeks. However, the show does a lot to intentionally flip these types on their head. AJ borders on prissy, arguably feminine at times. Rick is not entirely able to handle the macho man activities set before him. And they both essentially turn into small children where their mother is involved. I think the show as to be in on the joke. Either that or the actors were given a lot of leeway and were very aware of what they were doing. I also think we get some visible representations of masculinity. I mean in “Least Dangerous Game” there’s a scene where the brothers are playing basketball against one another in their mother’s driveway. Rick is wearing jeans and shirtless, with a torso covered in body hair. He clearly represents a very rugged masculine ideal, a sort of throwback to the frontiersman individual that is so important to the American image of the masculine (again, in case it wasn’t clear, COWBOY HAT). AJ is playing in dress pants with a button-up shirt that is unbuttoned showing off a smooth, but muscular torso. He’s the modern interpretation masculine ideal, still muscles and heteronormative; he’s the kind of man a 1980s woman (or pop culture representation of a 1980s woman) would fall all over. I kind of felt like this was a very intentional choice, because why else would they even have that scene? I don’t give this show credit for much. Not for storytelling, or direction, or entertainment, or cleverness, or originality. But, I do believe that this was all very intentional. It’s just too in your face for it not to be. Not to stick up too much for SIMON & SIMON, but I think you were a little hard on it. As a one-hour helping of humor and action, it does the job. I can’t speak specifically about these episodes because I haven’t seen them in ages (and I didn’t really watch the show a lot when it was on). The show spent a lot of time finding its sea legs in the first year, right down to changing its opening theme. It was a big ratings hit when it followed MAGNUM, P.I. on Thursdays, and you can see the similarities between the two shows (though MAGNUM was the better). I believe 70% of a good television series is casting–audiences will follow actors and characters they like almost anywhere–and the S&S leads have real chemistry, giving the impression of inviting the viewer along for a good time chasing bad guys and chasing women.